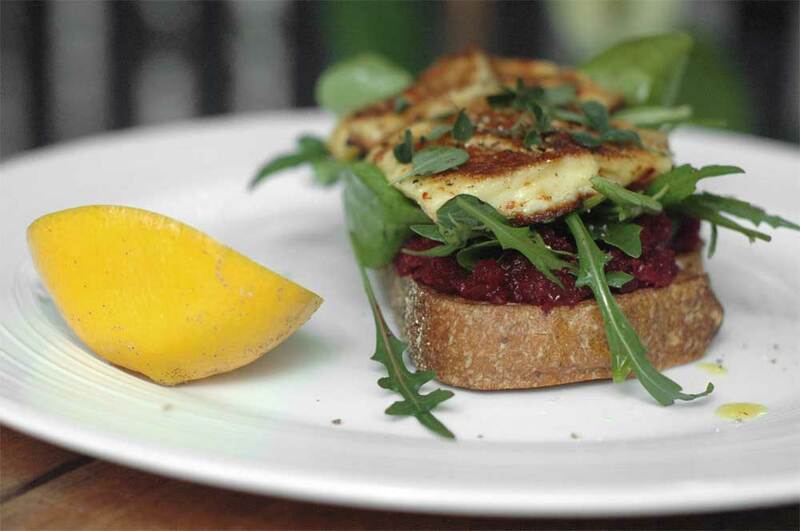 This colourful open sandwich makes a lovely light lunch or brunch and more beetroot relish than you’ll need- leftovers are great with pan fried fish or felafels. If you’re short on time substitute a pre-made beetroot dip or spread- we love Yalla’s Beetroot & Sumac Relish. 1. Place beetroot in a medium saucepan, cover with water and bring to the boil over a high heat. Reduce heat and simmer rapidly for about an hour, until tender when pierced with a knife. Drain, cool under cold water and peel (use gloves if you have them as this can be a messy affair!). Cut into rough chunks, combine with remaining relish ingredients in a food processor and pulse at medium-high intensity until combined but chunky- you may need to scrape down the sides once. Taste and season relish then set aside. 2. Pre-toast sourdough so it only needs to be warmed before serving. Heat a large fry pan over medium to medium-high heat. Combine flour, salt, pepper & chilli flakes in a shallow bowl and toss haloumi in it to cover lightly. Add ghee to fry pan, swirl to coat and carefully add dusted haloumi slices. Cook for about 2 minutes on each side, until golden brown, then drain on kitchen towel. 3. 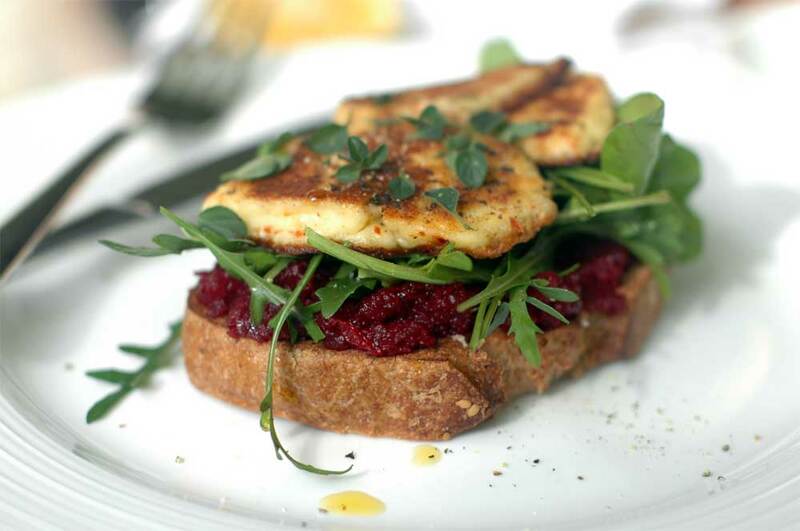 Working quickly, toast sourdough briefly to warm through, spread each slice generously with beetroot relish, top with rocket and two slices of haloumi. Serve with extra marjoram, cracked pepper and lemon wedges on the side.